to keep your property safe for employees, while allowing your business to operate with as little interruption as possible. For this purpose, we make every effort each season to provide a high level of service, meeting both the snow-plowing and salting needs of all of our commercial customers. Our services and policies are listed below. Detailed cost schedules are provided on the contract for your particular property. If you have any questions, please check our FAQ. Interested in receiving a quote for your property(ies)? Contact us today! 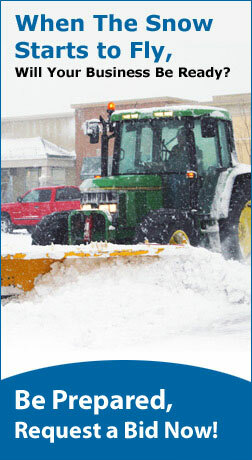 Plowing of parking lots, including truck wells, and loading docks. 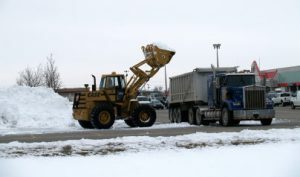 Salting of parking lots, using bulk rock salt via-medium duty dump trucks. Shoveling of walkways and public sidewalks, if applicable. Ice melter application on sidewalks and entrance-ways. Buckets are available to place near front, side, or rear doors if desired. Loader Work, including removal and re-stacking of snow piles. Our services are automatic. In order to most efficiently and effectively service all of our customers, we initiate services based on the type, timing, and intensity of each winter weather event. Ideally, you won’t ever need to call us. Of course, we are always ready to respond to your requests, and are available during the winter months to serve you 24 hours a day and 7 days a week, if necessary. Our services are customized to your needs. We know that businesses and organizations have different needs, which is why we tailor our services to your particular situation. We develop our routes and respond to weather events based on your business’ operating hours and desired level of service. We are flexible enough to handle almost any commercial property, from small industrial tooling shops to large retail complexes. Contact us for a list of references.